A red giant is an enormous, highly luminous star, typically tens to hundreds the times the diameter of our own sun, that represents the late stages of the stellar evolution of a main sequence star. Typically for stars between 0.5 and 6 solar masses. The greater the mass of the star, the more quickly it will enter the red giant phase of its evolution. The red giant stage begins when a main sequence star exhausts all of the hydrogen fuel used for nuclear fusion in its core. The hydrogen located just outside of the core, however, will not fuse due to the lower temperature of the region. The star will then begin to contract under gravity, and the outer layers of the star will start to collapse. As the shells of hydrogen gas contract towards the core, they heat up, eventually reaching the temperature required to fuse the hydrogen into helium, providing a new source of energy and halting the collapse through a renewal of stellar fusion. As the star has now grown hotter than it was during the star's life during the main sequence, the outer parts of the star begin to swell. Because of the expansion of the outer layers of the star, the energy produced in the core of the star is spread over a vastly larger surface area. This results in a lower surface temperature, which shifts the star's visible output towards the red side of the visual spectrum. 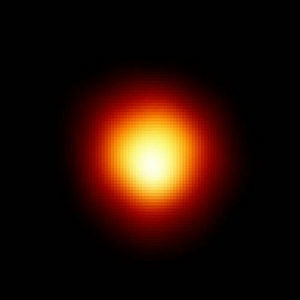 Depending of the mass of the star, there are two different routes the red giant's evolution will take. For those stars that are less than 2.55 solar masses, the core will continue to contract until it becomes degenerate. At this point, the core will not contract any further, but will continue to heat up. As the temperature reaches 108 K, it will become hot enough for the core to begin fusing helium to carbon and to a lesser extent, oxygen. As degenerate matter is an excellent conductor of heat, all the helium will be fused nearly simultaneously in a helium flash. For more massive stars, the 108 K temperature required to fuse helium will happen as the core is still contracting, allowing for a much more fluid fusion of helium, avoiding the flash. Once the helium begins fusing, the star again contracts and leaves the red giant stage. For stars around the mass of our Sun, insufficient mass exists to fuse oxygen and carbon into heavier elements. Once the star lacks any more helium to fuse, the star will eject its expanded outer layers as a planetary nebula, exposing the core. The star thus becomes a white dwarf, slowly cooling off over time. More massive stars will continue to fuse the carbon and oxygen into heavier elements. Any stars that are 10 solar masses or greater will instead become red supergiants before ending their lives in a supernova explosion. Low mass red dwarfs will not have sufficient mass to fuse helium and thus never enter a red giant phase, but instead will simply cool over time once all the hydrogen fuel is consumed. ↑ The Cambridge Atlas of Astronomy (2nd ed.). Cambridge University Press. 1988. pp. 255. ISBN 0-521-36360-8. ↑ Zeilik, Michael A.; Gregory, Stephan A. (1998). Introductory Astronomy & Astrophysics (4th ed.). Saunders College Publishing. pp. 321–322. ISBN 0030062284. This page was last modified on 15 August 2016, at 12:17.